All models come with the flip up mounting brackets. The ladder is hinged at the mounting brackets to allow the Aqua-Stairs® boat dock ladder to be easily lifted out of the water for storage. Made from marine grade aluminum (2 1/2" Round Tubing). These dock ladders are heavy duty with a 500 lb. weight capacity. 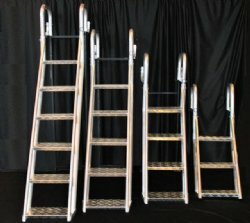 Aqua-Stairs ® boat dock ladder is a staircase design with a 58 Degree angle (Climb Angle is 58 degrees - measured from a 90 degree vertical drop). Steps are Wide Steps, approximately 8 inches deep, allowing much more comfortable footing. The steps are made of textured plate aluminum to prevent slipping and are rolled at the front providing a smooth edge to prevent cuts. Only 4 bolts are required to attach it to a fixed dock, floating dock, swim platform, seawall, bulkhead, or pier. 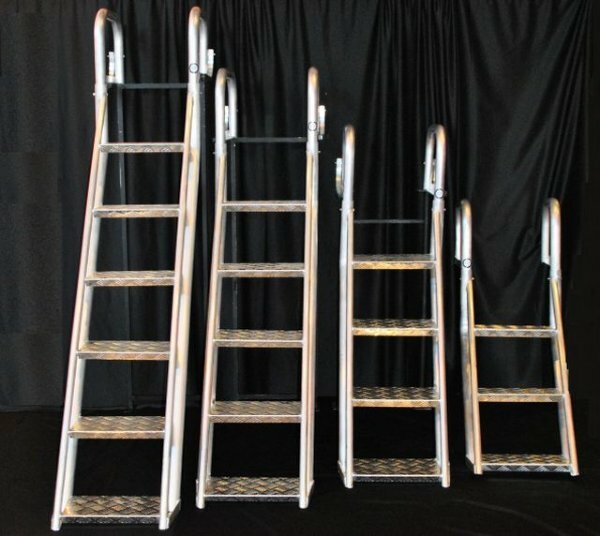 Each step on an Aqua-Stairs® boat dock ladder is approximately 16 inches wide and is hemmed at the front providing a smooth edge to prevent cuts. Vertical height between steps is approximately 12" inches. When installed, the Aqua-Stairs® boat dock ladder can be solid mounted by bolting the upper plate directly to the mounting surface or it can be attached via the included hinges, allowing it to flip-up and out of the water to prevent marine growth while not in use. Pets - they can easily get back out of the water without you having to either pick them up or send them back to the shore. No more tracking of dirt off the bank or shoreline when your dog comes up the ladder. In the event you aren’t watching your pet, it can just come up on its own. Elderly and Children - these steps enable our elder citizens and children to get in and out of the water where they were previously unable with conventional boat dock ladders. 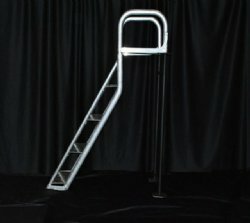 Some disabled people may be able to use the Aqua-Stairs® boat dock ladder as well. Any Adult - Why climb out of the water when you can stand and walk up these steps.